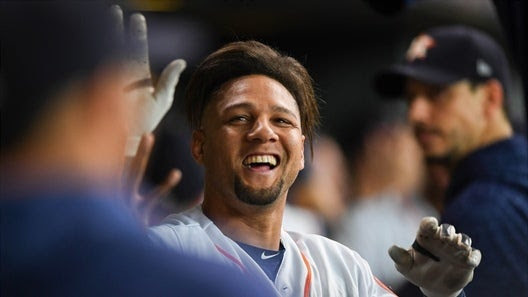 Yuli Gurriel was an all-around champ this week, as he cranked out 2 HRs, totaled 5 RBIs, and swiped 1 base. SCHNOOKERS had the biggest jump in the rankings thanks to Yuli Gurriel. SPACE COWBOYS have now had thirteen straight weeks of above-average team performance. Putting up 41 RBIs, 12 home runs, and 4 wins allowed SCHNOOKERS to rocket up four slots in the power rankings. Jake Bauers is on a disturbing slide, doing worse in our roto player metric in each of the last three weeks. TEABAGGERS have now had to deal with seven straight weeks where Ehire Adrianza has underperformed his positional average. ARMCHAIR SLUGGERS dropped and no one is more to blame than James Paxton, who sported a 27.00 ERA, notched a 6.00 WHIP, and won 0 games. SKINS have been enjoying the services of Kole Calhoun, who has given them seven straight weeks of above-average roto performance. Chris Sale’s recent pitching performance hasn’t been hurting at all, but apparently his shoulder has been. He’s back on the DL with inflammation. SALUKIS is moving up largely on the strength of their performance in the HRs category, where they have banged out 42 HRs over the past three weeks. SHAMS came up with a 0.79 WHIP, a 2.63 ERA, and 25 RBIs, but stayed in the same spot this week due to a horrible performance in the wins category. MASTERBLASTERS put up a .309 BA, 37 RBIs, and 11 HRs, but that wasn’t enough to get them out of the 11th spot for the 3rd straight week. DEADZONES hasn’t had an above average team performance in thirteen weeks.